01. 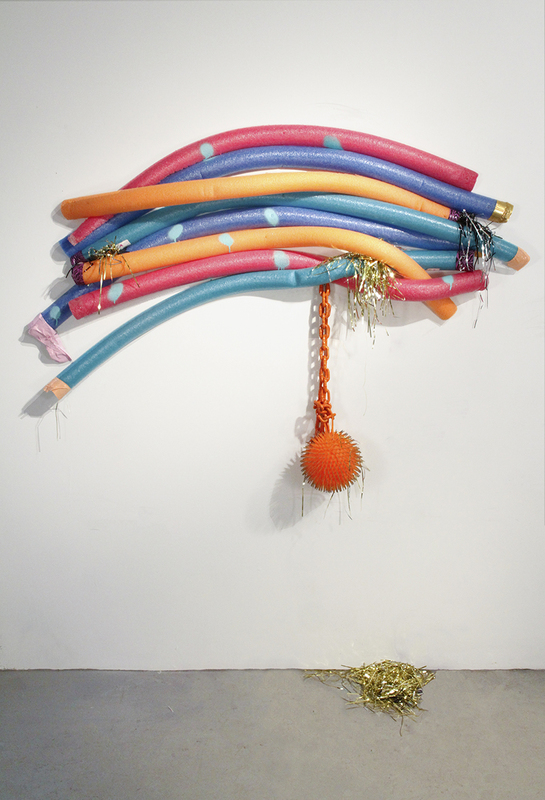 Ball and chain, 2016; Swimming pool noodles, spray paint, duct tape, chain, googly ball and metallic shred. 69” x 59” x 12”. 02. Tired can’t hang, 2016; Tire, plastidip paint and spray paint. 25” x 42” x 13”. Cuchifritos Gallery, NYC. 03. 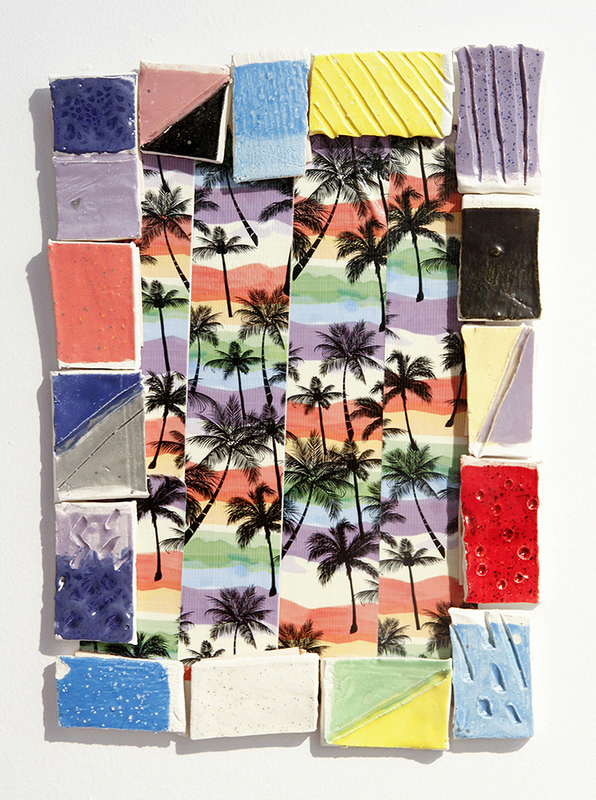 Another day in paradise, 2016; Glazed ceramics and duct tape. 14”x 10”. Cuchifritos Gallery, NYC. 04. Under the wires, 2016; Metal, ball, spray paint and sand. 26” x 27” x 14”. Cuchifritos Gallery, NYC. 06. 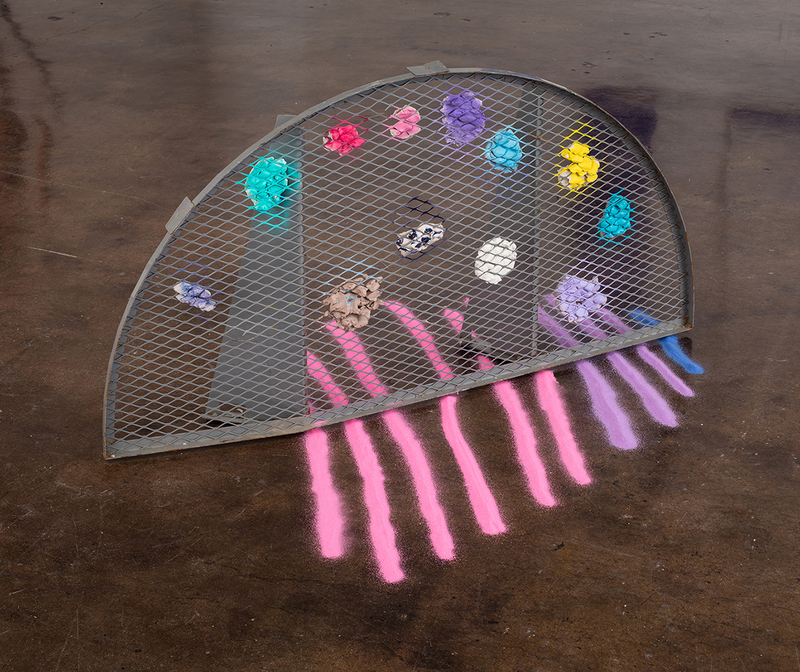 It’s rainbows and unicorns!, 2016; Plastic, plastidip paint, spray paint, duct tape, duster, plexiglass, colored sand, cement, metallic shred, ball and circular light bulb. 88” x 59” x 17”. 07. 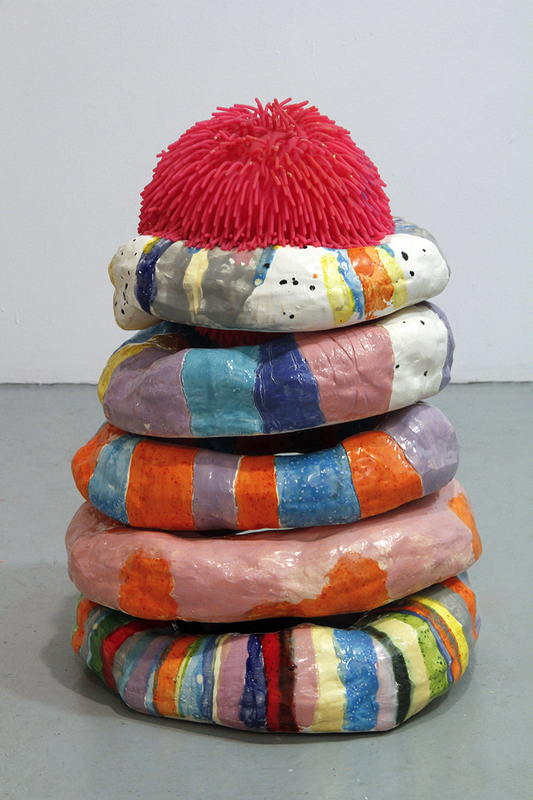 Donut-man, 2015; Glazed ceramics and googly ball. 18" x 11" x 14". 08. 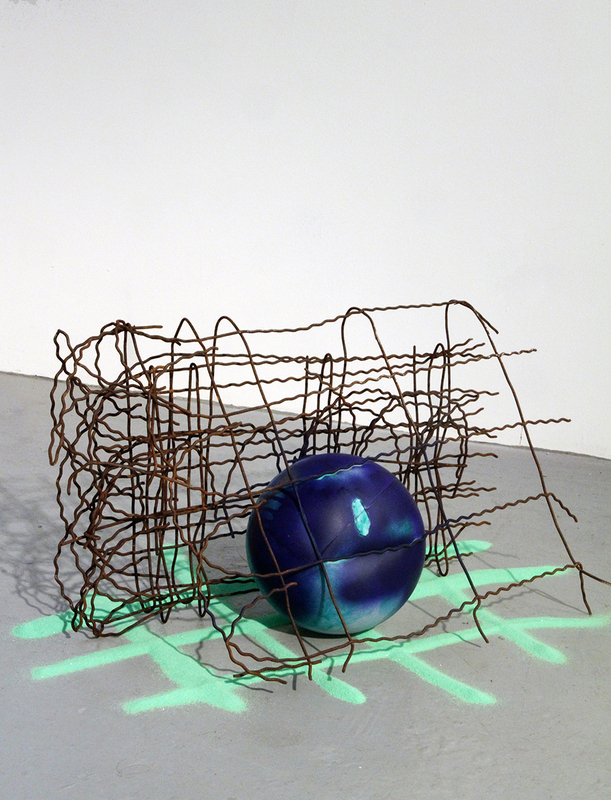 Half moon fence, 2015; Metal, clay, spray paint and sand. 30" x 61"x 46". SVA Chelsea Gallery, NYC. 09. 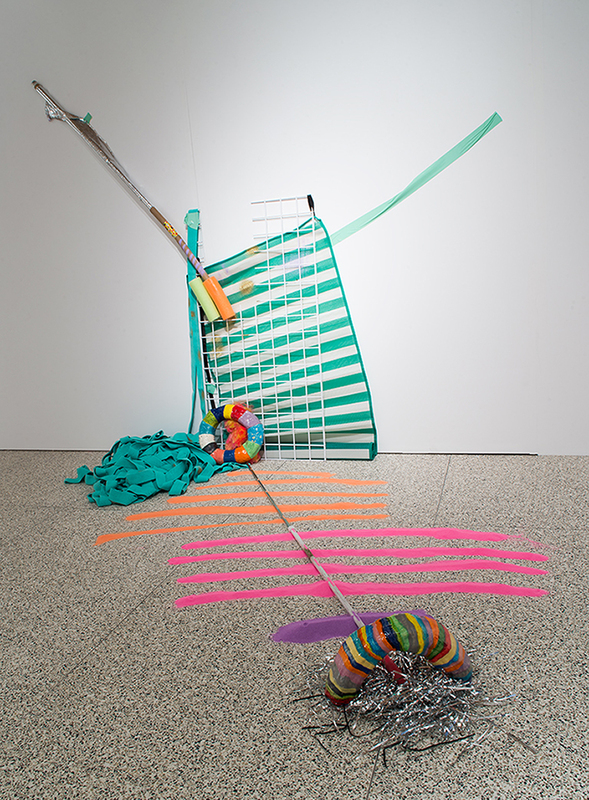 Finisher, 2015; Umbrella, plastic stick, bubble wrap, marathon insulation blanket, duct tape, spray paint and swimming pool noodles. 92” x 41” x 12”. SVA Chelsea Gallery, NYC. 11. 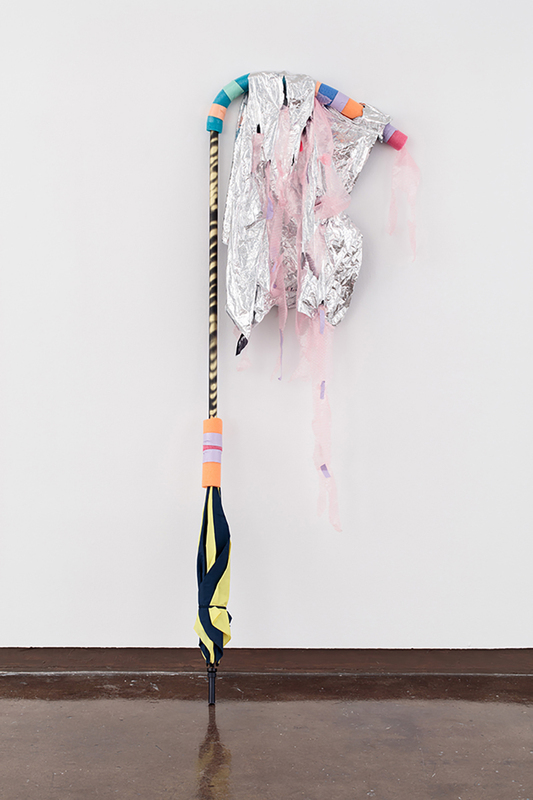 Buoyant, 2016. Markers, pencils, ink, acrylic, tape, charcoal, correction tape and spray paint on paper. 47” x 118”. 12. Spartan Follies, 2016; Tires, spray paint, plastidip paint, paracord rope, fitness balls, sand, chains, bolts and duct tape. Variable dimensions. 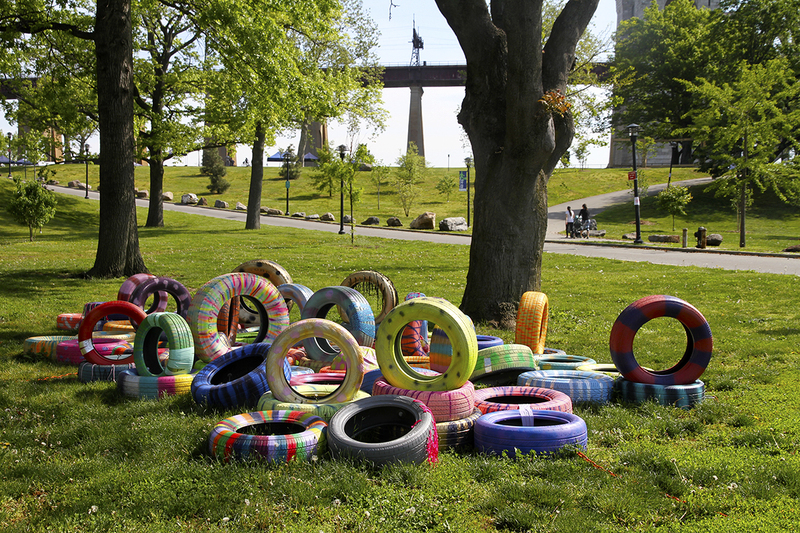 Public artwork for FLOW.16 in Randall’s Island Park, NYC. 13. 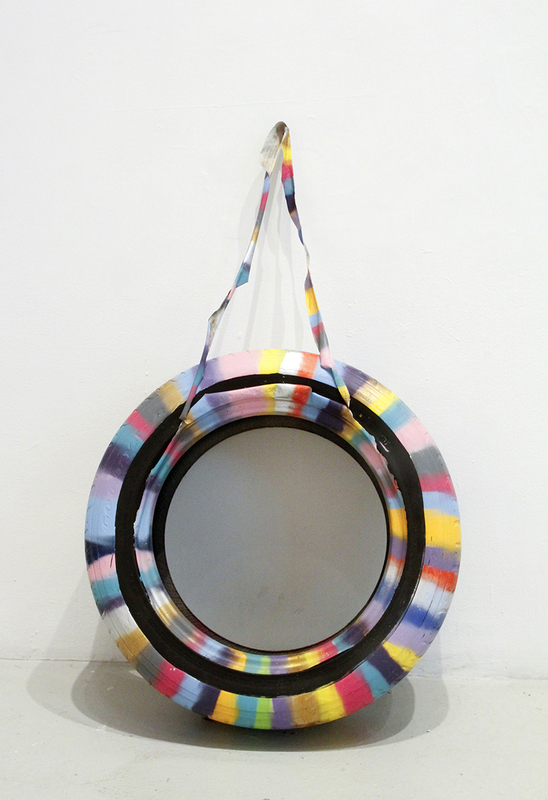 Spartan Follies, 2016; 24” diameter PVC pipe tube, plexiglass, wire cable, spray paint, resin and metallic shred. Variable dimensions. 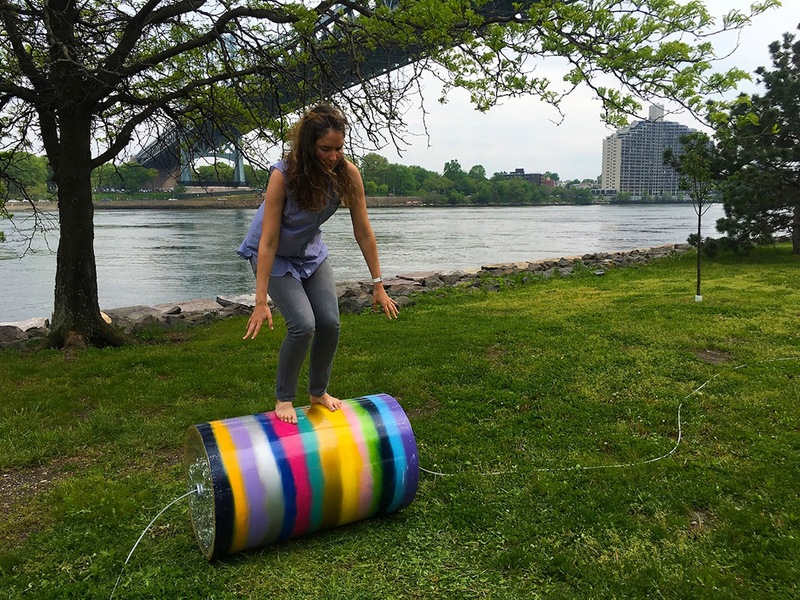 Public artwork for FLOW.16 in Randall’s Island Park, NYC. 14. Spartan Follies, 2016; PVC pipe tubes, plexiglass, chains, spray paint, resin, aluminum foil paper, packaging peanuts and metallic shred. Variable dimensions. 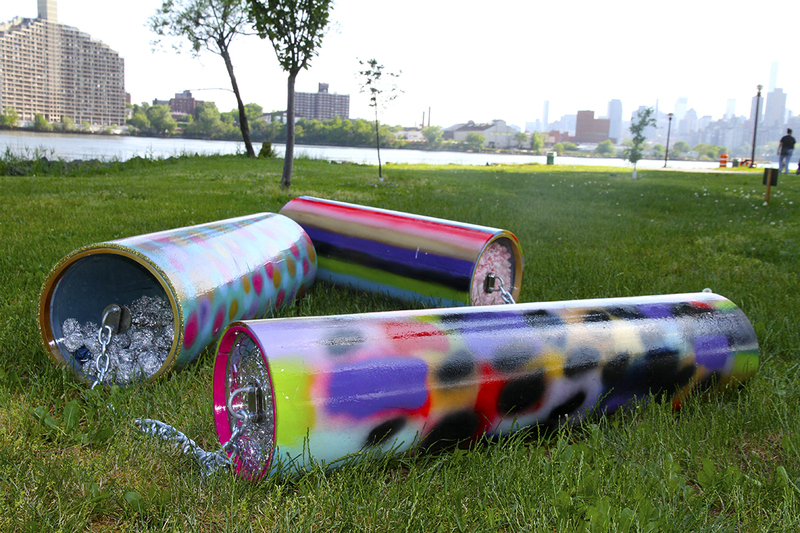 Public artwork for FLOW.16 in Randall’s Island Park, NYC. 17. Hot dogs no more, 2015; Hot dog cart umbrella, googly ball and model magic clay. Variable dimensions. Bronx Museum for the Arts for AIM Biennial, NYC. 18.	Who let the stripes out?, 2015. 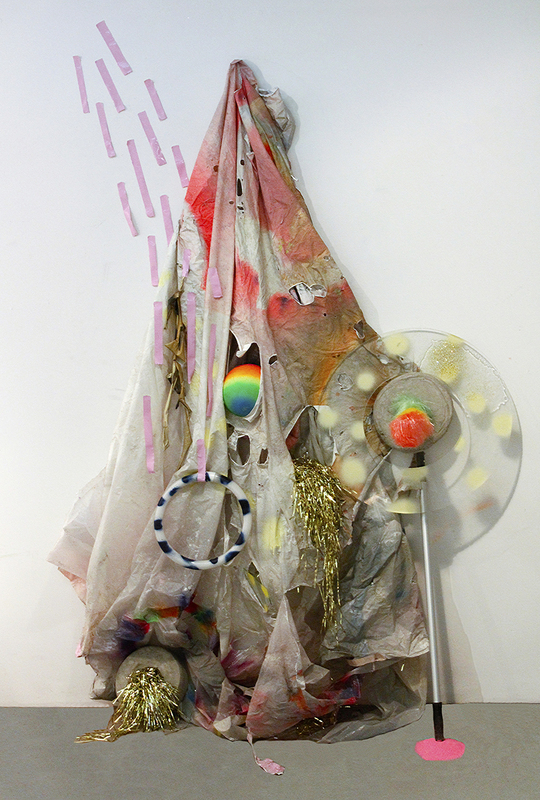 Found objects, glazed ceramics, sand, metallic paper, duct tape, metallic shred, duster and fabric. 85” x 78” x 67”. Shirley Fiterman Center, NYC. 19. Stacked Deck, 2016. Tire, paracord rope, wooden pallet, vinyl fabric, swimming pool noodle, duster and spray paint. 45” x 38” x 43”. Cuchifritos Gallery, NYC. 20. Weave done it, 2015. Hand-woven textile using found fabric, duct tape, bubble wrap, plastic wire, plastic and aluminum foil. 76" x 44" x 29". LVL3 Gallery, Chicago. My work repurposes found and ready-made objects spontaneously encountered during my daily life. 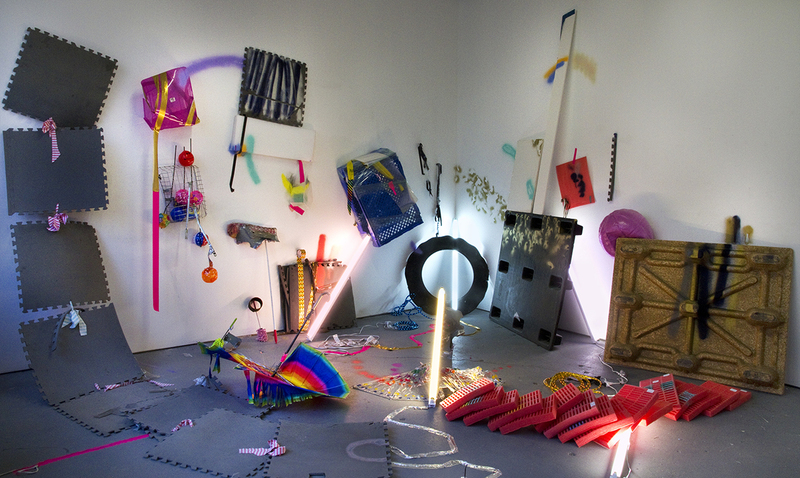 These materials become part of sculptures and whole room installations that are endlessly in-flux. 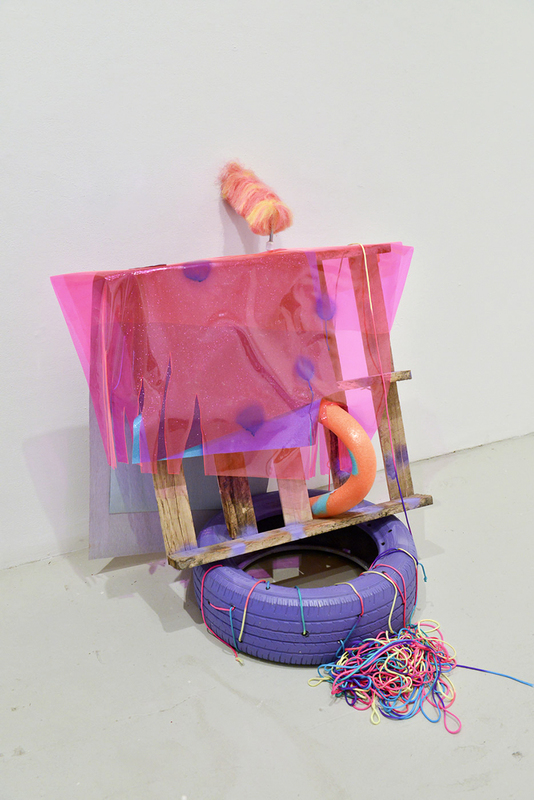 Precariously constructed sculptures result from a process that embraces chance, explores material relationships and mostly uses what is at hand. By using the excess from society, I point at a throwaway culture where things are easily disposed of. at a story, my compositions exist as unfamiliar abstractions. 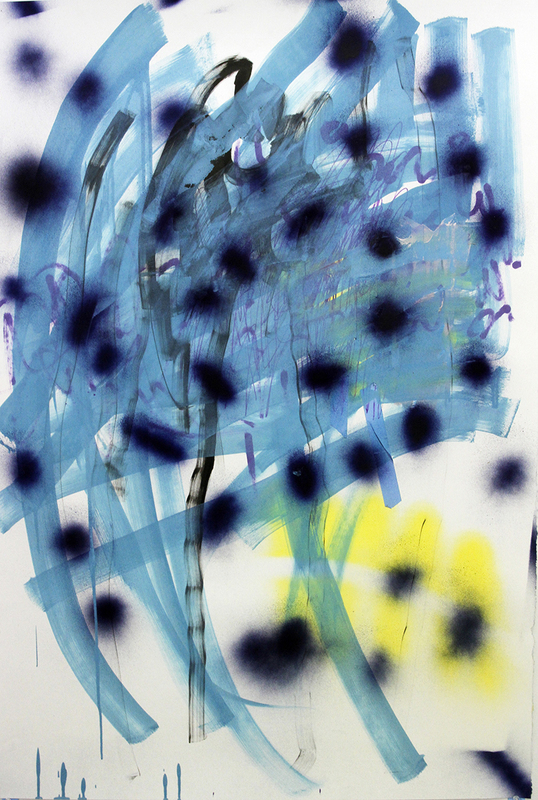 Conceived in a playful and intuitive manner, the work examines ideas of informality, improvisation, and new forms of abstract assemblage. To investigate the relationship between the ready-made and artist-made, I often include crafted clay components that blend into the found elements. These ceramic objects are whimsical forms that I long for, yet I would never stumble across in the real world. 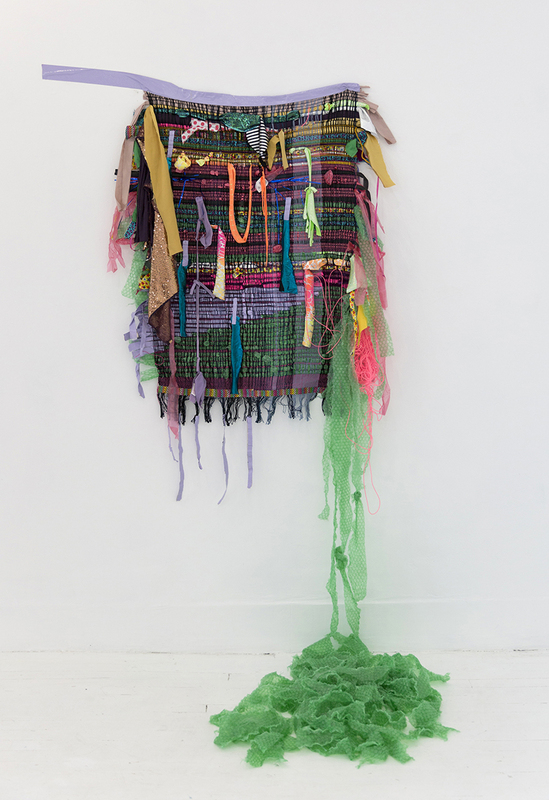 Juxtaposing handmade, bright, colorful, shiny surfaces against found, worn-out, dusty, plastic surfaces, the works blur their contrasting attributes, proposing instead an improbable material collision. 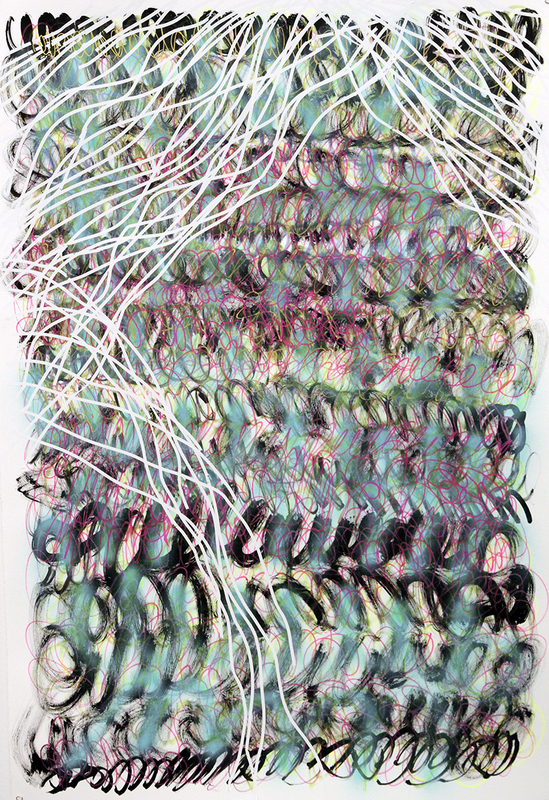 Like my assemblages, the painterly drawings I make employ the same disjointed process. Marks are gradually layered, as I explore movement, gestures and everyday materials for mark making. Some of these include markers, duct tape and correction tape, spray paint and glitter, among others. They capture the energy of my whole process on a piece of paper, a condensed sample of the gestures and spirit that are always present in my work. on no-man’s land: publicly abandoned yet unclaimed and overlooked by most people. I improvise and play, allowing myself to be surprised by materials and their infinite possible combinations. Working both on the street and the studio, I examine how worthless fragments can be transformed into unexpected art experiences. Fine Arts Certificate, Pontificia Universidad Catolica de Chile. Santiago, Chile. BBA, Marketing and Administration, Universidad Catolica de Chile. Santiago, Chile. 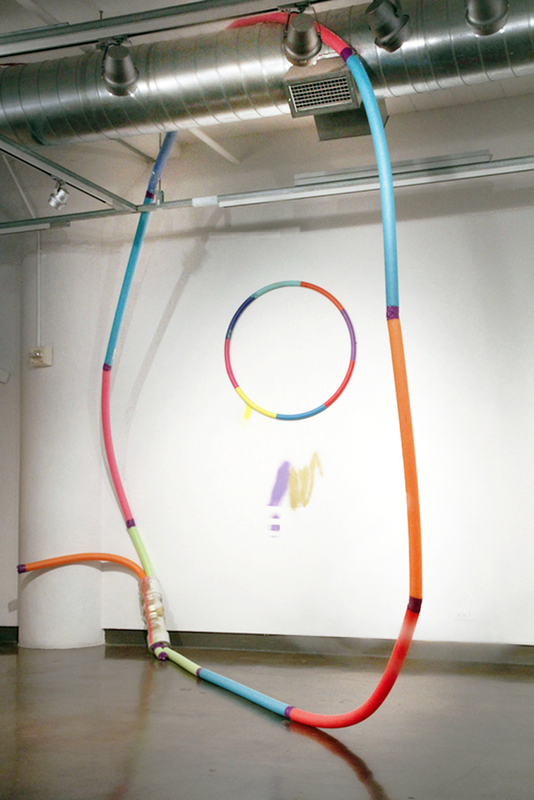 Expand and Flourish among new Acquaintances, Proto Gallery. 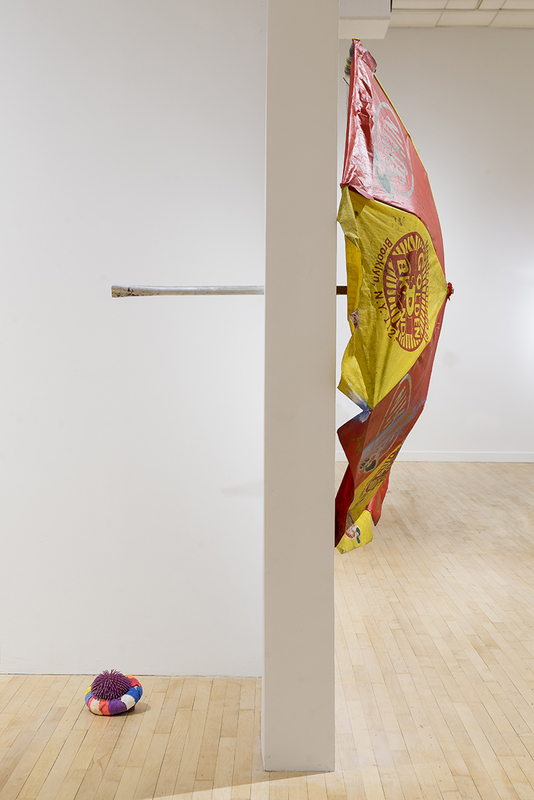 Curated by Enrico Gomez and Nick De Pirro. Hoboken, NJ. PASS/FAIL, Ortega y Gasset Projects. Curated by Will Hutnick. Brooklyn, NY. Art on Paper, Proto Gallery & El Dorado Projects, Booth 121. New York, NY. The Great Painting, Collaborative project. National Fine Arts Museum, Santiago, Chile. Born 1979, Chile. Flow 16 Public Sculpture Comission for Randall’s Island, NY. Awarded by the Bronx Museum and NYC Parks Alliance. “Versatile Technique” Paula Barrera. Periodico Al Limite. Page 40. Santiago, Chile. El Museo@SVA. Moderated by Rocio Aranda-Alvarado. SVA Chelsea Galleries, NYC. 2016 Playfulness. Moderated by Natalia Yovane. The Creative Salon, NYC. FUTBOLisARTE Corporacion Cultural Las Condes, Santiago, Chile. Conceived of and independently implemented every aspect of large-scale, national art-fundraising initiative to raise money for Chileans affected by the earthquake.